After a seven o’clock breakfast, the party split. Gill and John were driven in an open-sided vehicle. The rest of us were on foot led through the bush by guide Immanuel. It was proper bushcraft stuff. Tracks of aardvark and giraffe, and aardvark holes where we were advised not to stand in front of the entrance as they get taken over by all sorts, including warthogs that are prone to dashing out and sending you flying. There were piles of droppings, small to large, of springbok, gemsbok and giraffe, and leopard droppings like dog poo but containing lots of fur. Immanuel extracted an ant-lion larva from one of big patch of larval traps. 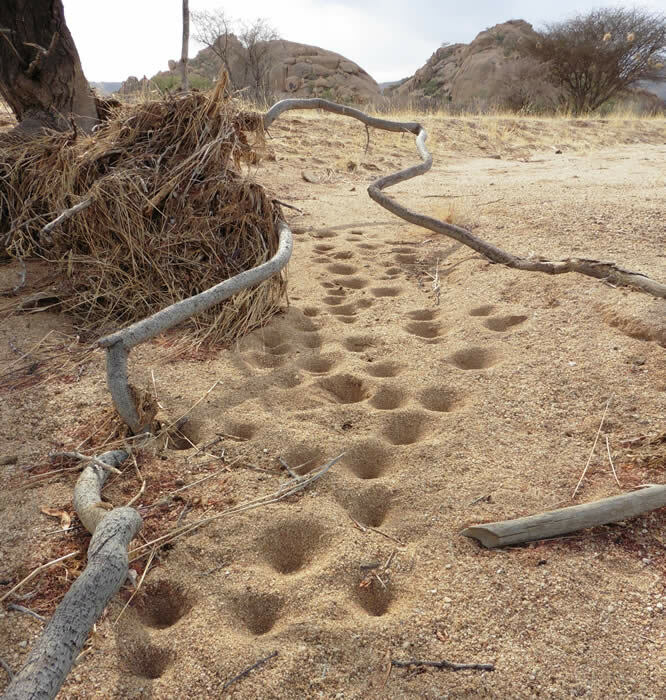 Ant-lion larval pits, Erongo Mountains. There were many dead giant millipedes, not a popular prey item as they contain strychnine. Ant trails led to holes surrounded by drying seeds, waiting to be taken underground. 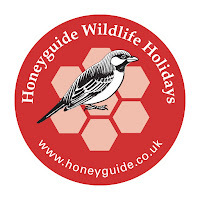 There were also the wiggly surface tunnels of harvest termites, which explained what the aardwolf seen on the Etosha night drive must have fed on in an area devoid of termite mounds. Trees included worm cure Albizia and a blue pea flower called cone or fish-poisoning bush Mundulea sericea. Cool at first, the morning was heating up as we arrived at a series of granite outcrops. This was where we were shown rock art, mostly iron oxide red paintings by an unknown local tribe (though loosely linked to the San or bushmen) at least 2,000 years ago, possibly much older. Many depicted figures, elegant-looking stick people, though whether other colours have faded or washed away from more complex originals is unknown. Mammals were clearly antelopes, springboks we were told, and less clear eland and rhino. Sand lizards with orange feet dashed around. A white-tailed shrike gave a plaintive whistle; with its rather short tail and black, white and grey appearance perhaps pied shrike would be a better name. There were orange-headed rock agamas, especially on the big boulders behind our chalets on our return. 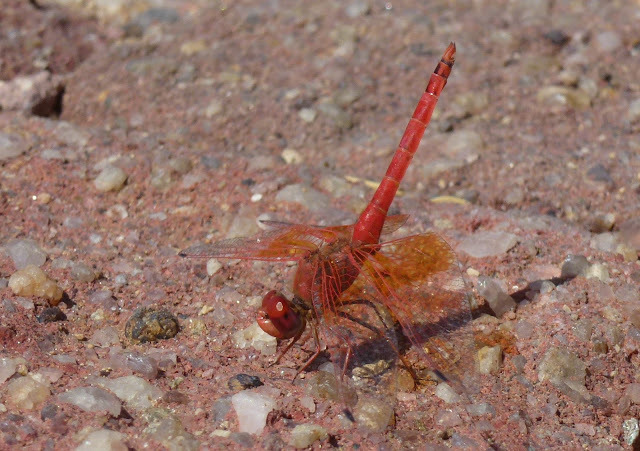 Orange-winged dropwing, male, by Erongo's swimming pool. Everyone pottered, chatted or rested before and after lunch. The concrete pond edge with stones attracted Namaqua doves, lark-like buntings and bright orange-winged dropwings, at least five males of the last also much in evidence around the edge of the swimming pool. For our afternoon walk, Geoff led us through a simple trail, marked by white arrows, up and along the ridge of rocks behind the chalets. This took us to yet more rock paintings, including people, eland, giraffe and elephant, and into discussion about what they might mean and the treatment of the San in recent centuries. 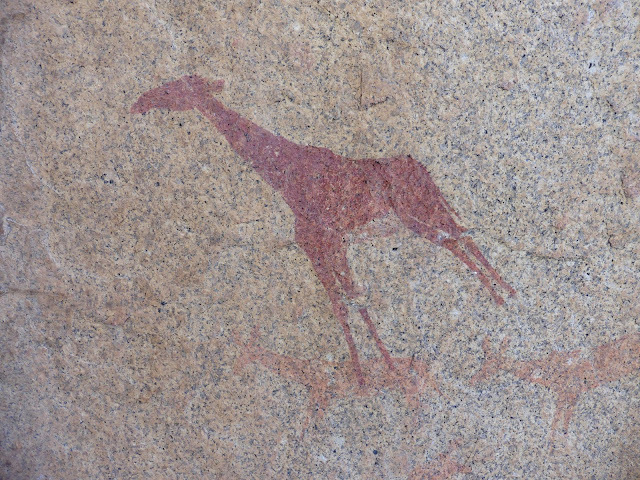 San rock art, plainly a giraffe. See also the antelopes (springboks?) below.